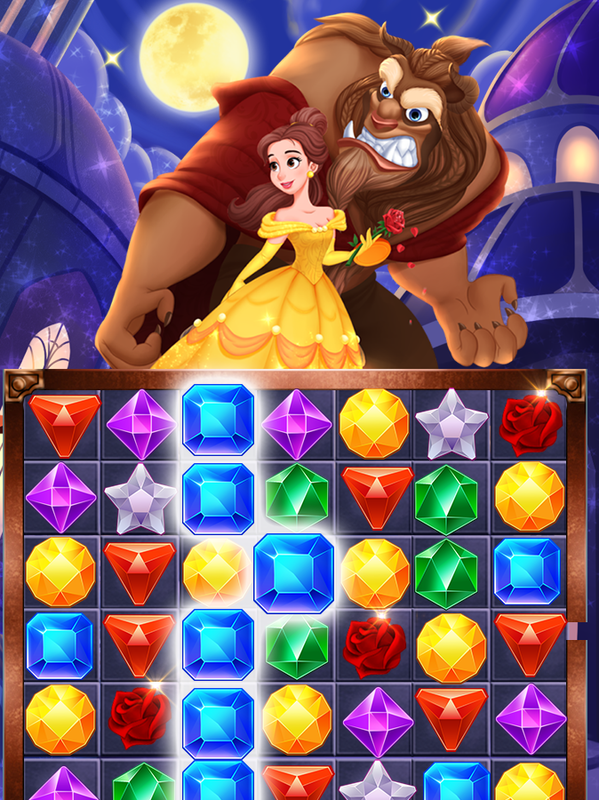 experience a tale as old as time like never beforeSolve magicalmatch-3 puzzles alongside princess & prince！Discover inventiveboosters and power-ups to create combos. Enchantment iseverywhere!Enjoy dozens of amazing levels in an epic puzzlematching adventure based on the romantic fantasy tale! Join yourfavourite characters on a journey to conect and match hundreds ofpuzzles for free!- Connect 3 or more diamonds to solve thepuzzles.- Make chain reactions and watch its power!- More than 850free addictive levelsHave a great experience playing this freepuzzle game. witch blast legendEmbark on this adventure, explorer this fantasticmiracle world and become a magical lenend!Test your skills in thismatch-3 game full of sorceressFor those who like witchery orwizardry style people, make sure to play this highly addictivematch 3 game with amazing graphics!how to play- swap and match 3sorceress puzzles in a line to remove them.- lighting effects caneliminate in one row or column.- combine enchanted items inspectacular combos to clear levels in big matches.- connectingitems to destroy weirds.highlights in witch puzzle:* free dailyspin bonus in times limits. * combine items to create massivemagical explosions and clear levels! * fREE Daily Spin Bonus intimes limits. * combine items to create massive magical explosionsand clear levels! * beat challenging wolf, Hungry Frog, Spider orothers. * puzzles and game modes as you explore the land with ournew updates! * strategic match, Less moves, Higher score, Easy3-stars! * amazing magical boosters to power up for Spooktacularlevels. * super easy and fun to play, but challenge to master! *super easy and fun to play, but challenge to master! * unveiledenhanced items such as magic fire, crystal ball, and magic bookwhen match 3 or more. Play princess bubble shooter games! Match 3 colors and burst thebubble in this free game! Enjoy these exciting puzzle games andpuzzle games as you break bubbles and any time is right for you toplay the best bubble games.Your finger move to the target, aim, andshoot!Match 3 bubbles can clear them！Clear all bubbles the gamelevels is complete. At the end of game, All bubble will be pop out.Tap the bubble also can get points as bonus.No matter where, Nomatter when.Bubble shooter is always on your side.The MostImportant:As a all free bubble shooter, We need ads to feed ourteam.If ads make you feel bad, you can close your wifi. glow block maniaThis addictive glow block puzzle game willchallenge you.Glow puzzle is incredibly intuitive and fun for allages and skill levels.Put the colorful blocks into the square areaby dragging and fill up all grids. as long as you tap sideways orvertically and connected into a line can be eliminated and gotscores. the more glow blocks eliminated you can, the more scoresyou will get. Your score will be based on how quickly you completethe puzzle. Compete with others based on your score!features:- onceyou start, you'll be hooked and addicted.- stunning blocks, simpleUI, classic puzzle game.- super Easy but need long-time training inmaster level.- smooth and delicate animation and very cool effectdesign!- challenge with your circles, defeat yourself isimportant.- play this brain puzzle game for any time, anywhere,pleasurable no wifi.Up for a challenge ? Show your friends howquick you are! panda classic bubbleLet’s help and secure the friends with thepanda.Panda classic bubble! is a shooting puzzle game that anyonecan enjoy.-It brings you amazing shooting experience hours ofendless fun. And it makes aiming simple but amazing-It is aSingle-player Game and No WiFi Required at all. Once you start, itis easy to play but hard to stop.-A Good for everyone BubbleShooter game. Have fun playing bubble shooter game! • exploring900+ challenging puzzles!• beautiful bubble shooter graphic !• getRelaxation and Fun!• excellent Ways To Kill Time!• train Your Brainand Exercise your eyes!• cool animation effects!• download for freegame!• appeal to all ages!• easy to learn and fun to play! fruit garden pop splashSo join this fruit world, match 3 or morefruitsWelcome to fruit paradise! Start your brain to play this gamewith millions of others players.There are all kinds of surprises inthe exploring the candy world.Sweet fruit candy is very popularwith women, the elderly, children welcome. Handsome boy and beautygirl also love it!How to play• swap to match 3 or more samefruits.• match fruit juice, fruit platter to get power-ups andwin.• collect fruits, and complete the game targets!• achieve 3stars to get better rankings!• enjoy other various missions! Join the ultimate multiplayer RPG monster battle raging across theglobe! Catch and collect legendary monsters, craft and evolve yourepic monster crew, and clash with rivals in PvP multiplayer puzzlebattles.From dragons and zombies, to mummies, angels, werewolvesand more, Shadow Wars has monster collecting packed with action,adventure, and strategy! Collect rare artifacts and balance yourmonsters’ abilities to build and unleash the ultimate crew. Team upwith other Shadow Master friends to form an alliance and fightother alliances in strategic PvP puzzle battles! Join the monsterwar or be destroyed.FEATURES:● Collect,level up, and evolve powerful monsters, each with unique skills andabilities ● Intense puzzle strategy — builda team of monsters, configure their skills, and plan your PvPplay● Form alliances with players fromaround the world — join forces in multiplayer raid battles anddefeat enemies in epic RPG card combat● Daily and weekly live events with big rewards — compete to collectrare monster characters, crucial resources, and legendaryartifacts● Artifacts to collect and furthercustomize your RPG puzzle playing experienceThe Photos/Media/Filesand Storage permissions are used to store game data and to allowyou to share your Shadow Wars monster with yourfriends. Shadow Wars is free to play but offers some gameitems for purchase with real money.We love to hear from ourplayers! On Twitter? Drop us a line @PikPokGames and join theconversation with #ShadowWars! Switch the Box is a very addictive character puzzle game. Test youlogic skills in this awesome puzzle game. Match 3 or morecharacters of the same type to make them disappear. Solve 120different puzzles in 5 different scenarios: Forest, Castle, PirateIsland, Moon, and Ice. Switch the Box also has a new Time Attackmode. Play to the best of your abilities and solve puzzle afterpuzzle before time runs out! How far can you go? Play Time Attackmode and find out!Play Switch the Box while waiting for yourappointment with the doctor. Play Switch the Box while waiting fora cab. Play Switch the Box now!Features:- 120 levels.- Time Attackmode.- Compete with your friends in the leaderboards!- Excellentmusic and sounds.- 5 scenarios.- Nice box graphics. Discover the most relaxing mix of classic mahjong and new puzzlesand enjoy over 1700 fun layouts in a fantastic journey around theglobe! If you love puzzle, strategy, memory, and brain trainingchallenges, you’ll love Majong! The innovative new version ofMahjong Solitaire. Explore the world's best cities as you tacklechallenging riddles. Power-ups and obstacles provide an unexpectedtwist to every level. And don’t forget to collect your rewards.Highlights: ▶ Enjoy 1700+ fun levels in a fantastic journey aroundthe globe. ▶ Go on a treasure quest and find over 250 raresouvenirs. ▶ Stunning graphics and original mahjong gameplay. ▶Claim your rewards in the weekly tournaments and quests. ▶ Collectbeautiful tile sets for endless tile matching adventures. Morehighlights: ▶ New goals, power-ups, and obstacles give Mahjongg awhole new twist. ▶ Play with others and enjoy your Mahjong journeytogether. ▶ Great fit if you love solitaire, tripeaks, jigsawpuzzles, mayong, word search and other ‘smart games’. ▶ Playoffline on your flights and trips. ▶ Playing with others does notrequire Facebook Login. ▶ Mahjong free with regular game updates. ▶Caring player support and best community. Can you beat level alllevels? Play and relax!